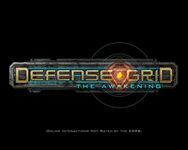 Defense Grid: The Awakening is a tower defense video game developed by Hidden Path Entertainment for Windows and Xbox Live Arcade on the Xbox 360. . . . Players must defend military bases from waves of attacking aliens by positioning a range of tower-based weaponry. All reviewers praised the game, with many noting that the quality of the game was high for a budget title. Source: Wikipedia, "Defense Grid: The Awakening," available under the CC-BY-SA License.